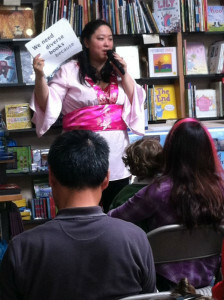 Author Emily Jiang introducing the title page of Summoning the Phoenix at Kepler’s Books. Photo by Richard Man. Emily is available to speak at your school, your library, your writing organization! She been a guest speaker for the Society of Children’s Book Writers and Illustrators and the South Bay California Writers Club. 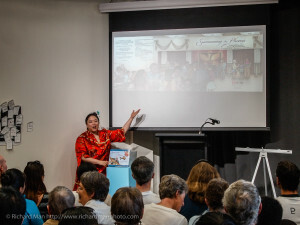 She has lectured about writing and literature at Saint Mary’s College of California, Berkeley Continuing Studies, and Beijing Normal University. She has taught writing to adults, teens, and children of all ages. 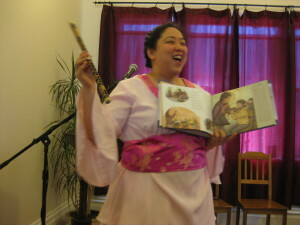 Author Emily Jiang presenting her book Summoning the Phoenix with a bamboo flute (xiao) at Borderlands Books. ***Publication Process, including How a Picture Book Is Published, How to Publish for Magazines, How to Publish Your Novel. ***Is Science Fiction Falling or Dying in the United States? Emily is happy to tailor her presentations to fit the needs of your audience. CONTACT THE AUTHOR TO SCHEDULE A VISIT!